Clermont, a former mining town, is 320 km west of Rockhampton and 100 km north of Emerald. It was apparently named after Clermont, France, a name possibly suggested by Oscar de Satgé, a pioneer pastoralist. Until gold was discovered at Clermont in 1861 it was a remote part of the Peak Downs pastoral district, which was settled by Europeans in 1854. The early gold finds were alluvial deposits, easily won by independent miners. The finds were near a seasonal lagoon – 'Hoods Lagoon' (quite soon 'Diggers Lagoon') – and a rudimentary hotel was built in 1862. The following year the settlement was proclaimed as the town of Clermont. 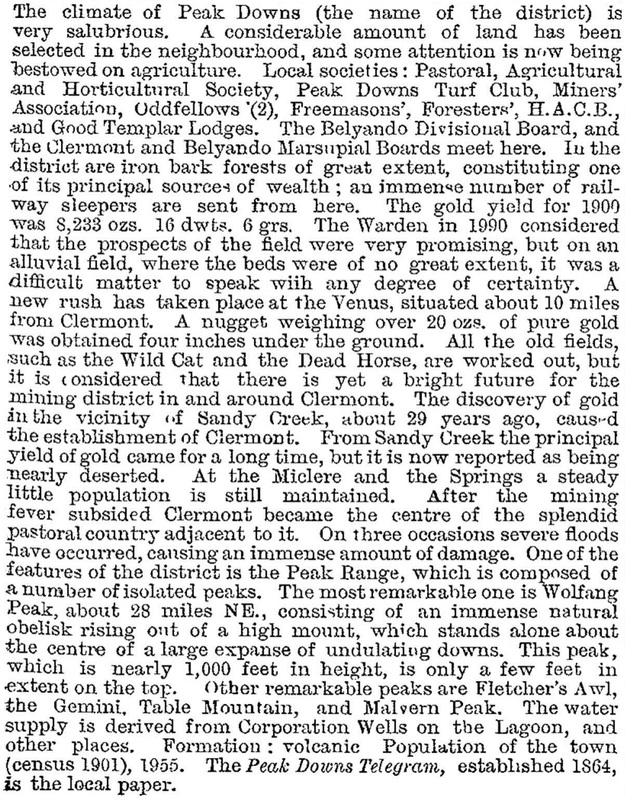 Population levels ebbed and flowed with gold finds elsewhere and the availability of water, but there was a sufficiently stable population for Charles Buzacott to begin publication of the Peak Downs Telegram and Queensland Mining Record at Clermont in 1864 (A lifelong journalist until his death in 1918, Buzacott was a forceful writer and later a Queensland parliamentarian). The Peak Downs hospital was opened in Clermont in 1865 and a Catholic church opened in 1866. The following year a state primary school opened, the town became a local-governing municipality, the venue for a livestock show under the auspices of the Queensland Pastoral Society in 1868. Eight years later the annual Clermont Show week was taken over by the Peak Downs Pastoral and Agriculture Society. Clermont's mining industry took on greater permanency in 1863 when the Peak Downs Copper Company began mining a rich copper lode a few kilometres south of the town. Around the mine grew the town of Copperfield, with its smelters producing 17,000 tonnes of refined copper over 15 years. 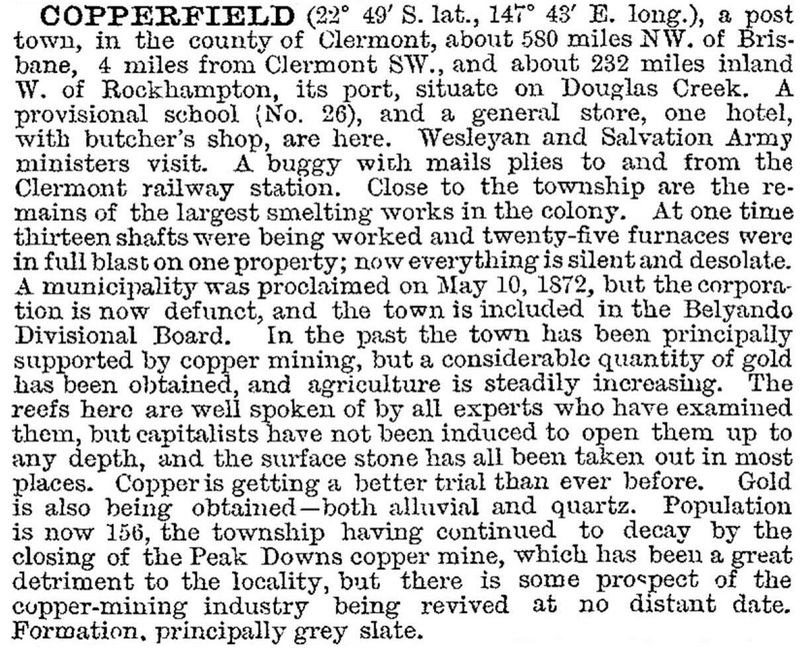 A separate Copperfield municipality was created in 1872, and the Australian handbook (1876) recorded a town newspaper, the Copperfield Miner, together with Church of England, Catholic, Presbyterian and Wesleyan churches, eight hotels and an estimated population of 2000 people. By the end of the 1870s, however, Copperfield's population had halved, for London copper prices had fallen and competition had arisen in the form of new mines at Cloncurry and Mount Perry. Mining revived in the late 1890s and the school re-opened, staying open until 1942. Copperfield is now marked by one remaining brick smelter chimney, restored in 1988 as a Bicentennial project. The lagoon, although an important water source sustaining Clermont, was also a potential threat to the town, with major floods in 1870, 1893 and 1896. In 1916 a catastrophic flood occurred, destroying the town's business precinct and claiming 65 lives, the second worst flood fatality count in Australian history. The town was subsequently rebuilt on higher ground, south of the lagoon, and some of the surviving buildings were moved to the new site by a traction engine which has been preserved in Centenary Park. Other troubles were less acts of God than of 'man': Clermont was the scene of several anti-Chinese race riots in the 1880s, and was involved in the Shearers' Strike of 1891, when several hundred troopers separated union and 'scab' labour. In 1930 the town was amalgamated with the Belyando Shire, and in the same year commissioned an electricity-generating plant. Further modernisation came when the faltering pastoral show was revamped as the Rodeo and Show Society (1932). More modernisation awaited the postwar years: town water reticulation (1957), a state high school (1958), an Olympic pool in place of the lagoon (1960), the Myalla performing theatre (1961) and a new civic centre (1961). In 1972 houses from Blair Athol were transferred to Clermont because they were in the way of future open-cut coal operations. 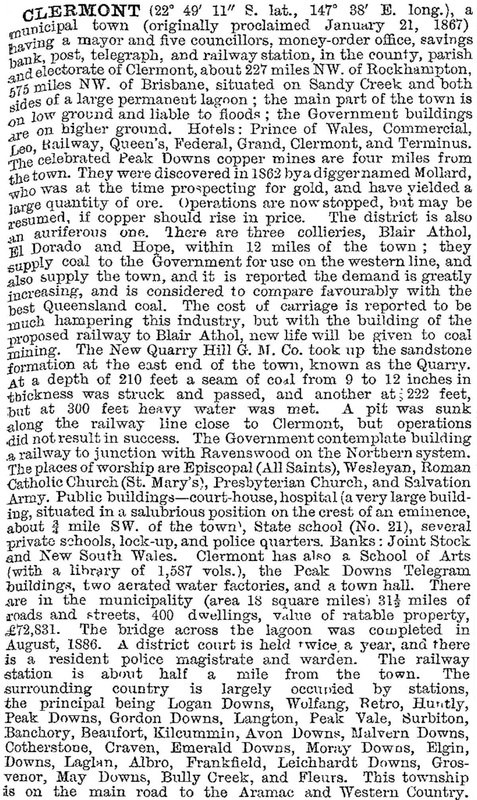 When large-scale mining returned to Blair Athol, Clermont became its dormitory suburb. Clermont has a comprehensive local shopping centre, bowling, golf and swimming facilities, a racecourse, a showground, saleyards, a hospital, the state primary and secondary schools (1867, 1990), a Catholic primary school (1900) and the shire civic centre. St Mary's Catholic church (1890) is an impressive timber building, and 'Carinya' (1912) in Daintree Street, is similarly eye-catching. The Clermont Club is one of Queensland's oldest men's clubs. The Clermont cemetery (1866) was added to the Queensland heritage register in 2010. The town hosts an annual coal and gold festival which acknowledges, among others, Chinese residents of the town since the 1860s gold rush. Clemont was named in the top 25 growth suburbs in Australia in RP Data's 2008 survey.